Hell, we haven’t even found the path yet! Nor have we seemed to figure out that we should put the shovel down and stop digging ourselves a bigger whole with the policies our exalted officials seem to enjoy passing. It’s about time we woke up to the need of reforms that neither the Democrats nor the Republicans are willing to deliver, (probably preaching to the Choir on that one). Do the Rich Need the Rest of America? Of course America is still the #1 consumer in the world, but that wont last long with China fast approaching. But large investors primarily care about their return-on-investment and with the financial elite decoupled from America they – and their money – may go where they please… especially when many smaller countries actively design laws to attract just these types of individuals. Why invest in America when our real estate market is in perpetual decline and consumer spending is still down and out getting kicked in the stomach by all the bad debt we took on? Nothing Obama or the Democrats have done has reversed this trend, rather current policies are helping to exacerbate the divide at an accelerated pace by making middle class America poorer in absolute terms – thus stifling consumer spending – and increasing the cost of labor and so stiffing new hiring. Take the bail-out of financial institutions. Banks are once again experiencing record-setting profits. Money borrowed with the collateral of middle class labor went to pay for the bail-outs so that a small elite of this country could see their quarterly profit statement and bonuses increase. Redistribution of wealth from the bottom to the top. A point that Robert Reich makes in How to End the Great Recession. “In the late 1970s, the richest 1 percent of American families took in about 9 percent of the nation’s total income; by 2007, the top 1 percent took in 23.5 percent of total income.” It seems that trickle down economics was a success… wealthiest Americans captured the most benefit from forty years growth while the rest of America had to make do with something akin to that slow annoying drip from a broken faucet. On top of that the average person is now receiving almost zero return for their savings even as the American people are forced to save to pay down debt, debt which has probably seen an increase in interest-rates. So while the financial elite can borrow at almost zero from any number of international financial centers the rest of us are stuck with a larger bill, thus less money to spend, begetting a worsening economic picture. Not only did healthcare premiums see the biggest single year increase in a decade, but in addition “the average employer contribution to a family plan did not go up at all this year, meaning the entire increase was borne by workers.” Why hire a new full-time employee today when they will end up costing your company tens of thousands of dollars extra in only a few years when many companies today can’t even afford their current healthcare and employee pension obligations? As I argued in an earlier post, America has built a system by which investment in out-sourcing and labor-saving capital improvements garner far greater returns than compared to investing in new employees. We need a reset, a way to re-balance the relationship between labor and capital because no balance currently exists… rather capital seems to be standing on the throat of labor. During the FDR era this re-balance came through enacting legislation that protected labor, made organizing easier, and provided a social safety net. These policies allowed for the great production of America’s factories to be bought up by the new middle class. Such reforms reset the stage and allowed a new economic relationship to drive the economy for the better part of 50 years. Such a set of policies wont work today, but we still need an equivalent set of reforms that are powerful enough to fundamentally reset the structure of our economy and re-balance the relationship between capital and labor. We need creative ways in which to make the American worker less expensive and a better investment compared to Chinese labor or labor replacing machines without forcing people to take 50% pay cuts just to find work that they are overqualified for. Robert Reich has a few proposed solutions over at the NY Times that fall well short of sweeping reforms, just more of the small tweaks we have been seeing for so long. Given our current situation, we need true courage rather than fear mongering to get started rebuilding our country, but somehow I doubt we will hear the starting-gun. there’s definitely a reason EFCA had no chance of passing, and that’s because democrats have pretty much abandoned labor. they followed the path clinton set before them toward the big bucks, and now they fly the corporate banner of neoliberalism. and what better threat to break labor than outsourcing? personally i don’t see how this disparity in wealth is going to be addressed by anyone without very bad things happening. maybe if the gears of globalization broke down the cost of outsourcing would become too high, forcing investment to return to america’s manufacturing capacity. the way it stands, supporting unions has become synonymous with being anti-business. despite concession after concession by unions trying to salvage jobs, the only way to be pro-business is to completely whore your community/state/country to corporate predators. Talk about antique thought process. We’re losing manufacturing jobs and the middle class? How about everyone is losing blue collared unskilled jobs-not to the greedy rich, but to machines. Ever used an automated check out at WalMart or Home Depot? Ever used a automated operator-press 4 for plumbing? Robots or their reasonable facsimile don’t charge over time. I dont think I ever mentioned manufactoring. And we’ve been losing the middle class for 20-30 years, its just that it didnt seem that way because people just took on more debt to keep up with the Joneses. Then the bubble burst and reality finally had to settle in and a lot of people will never have their jobs back. Like you say, machines or Indian labor can do it cheaper. There was a great feature in the Economist – which I can’t link to – about the newest wave of outsourcing which is hitting some of the most highly skilled professions… lawyers, engineers, designers, etc. So every job is potentially at risk unless we do something to rebalance how companies look at investing in capital vs labor. And Obama’s newest propossal, a tax credit that allows companies to take all the depreciation value over the lifecycle of a capital good and deduct it in a single year wont help either. Companies will basically get to invest for free, getting almost all of the money back in tax breaks the first year. It will encourage investment, but most likely in more labor saving technology. As I said in the main body of the post, every thing Obama does to help the economy actually just helps the owners of capital and large business and hurts workers. Workers, especially non educated and unskilled, hurt themselves. So who are you defending, third world type people? Cause what I’m seeing if you want to stay in the middle class and keep your job you have to invest in yourself first. who are you defending, swede? are you defending the educated, skilled financiers who use derivatives to create wealth off the backs of actual labor? are you defending those smart guys on wall street who figured out how to game the system, so companies like golden sacks can make money off of starving people? go ahead and defend those criminals and fraudsters, swede. i’m sure they appreciate having little peons like you focusing on dumb, unskilled americans instead of their massive wealth sucking fraud they’ve perpetuated against the vast majority of people in this country. And what do those skilled financiers make up of the general population-one thousand of one per cent? You want to change capitalism over a handful of parasites when 50% of the general pop. gets some kind of governmental assistance? And please tell me do you live in a cave? Do you have a retirement fund-is there a fund manager making money off your back? Do you buy any products? Do the products you buy benefit any owners or upper management? And finally why do you communicate with a computer? Why not use the post office who employes the less skilled? The financial sector now makes up between 8 – 15 percent of the total economy… Much more than the one thousand of one percent you say. And not nearly all of that is productive. Much of it is just pushing paper around or investments that don’t actually go to the real economy, just superfluous bets on other paper. These are the ones that liz and I are referring to. If you’re including everybody in the banking industry (tellers and janitors) you’re being stupid. I certainly wouldn’t include tellers. Of course they aren’t the ones generating profits, just acting as customer service people for those that the bank cant push fully into serving themselves at ATMs and online. I’m sure banks view most tellers as a drain on resources and a future source of streamlining potential so they can generate more profit. Swede, you are really out of your depth here. It is a fact that whole state economies have been effected by the outsourcing of jobs oversees. Look at what happened to the economy of Olympia, Tacoma and Seattle Washington when the Computer/High Tech field took a dump and consequently shipped tens of thousands of jobs oversees. As one of the workers displaced by this, I can tell you from first hand experience, a job at McDonalds certainly doesn’t replace a 75K job at Intel. In my opinion, it will get a lot worse before it gets better. There is no incentive for Companies to employ workers in the US when they can save millions or billions by hiring outside the US. There is a reason we are primarily a service industy country. Ya got a point, we’re outsourcing natural resource jobs and related industries. Oh, I forgot this one. We just loaned Mexico a couple billion to drill for oil in the gulf. While we(govt) insist of shutting down drilling there. So maybe government could give a little nudge by providing better retraining assistance and more education funding rather than giving big business the same old types of tax cuts. my below comment is meant to be a response to swede’s enlightened comment. All the training and education in the world will not be worth a tinker’s damn if the jobs you are trained for don’t exist. It doesn’t take a Search engine guru to find hundreds of articles about the economic outlook for all the new students graduating college. Sadly, college attendance is at an all time high but job prospects are at an all time low. 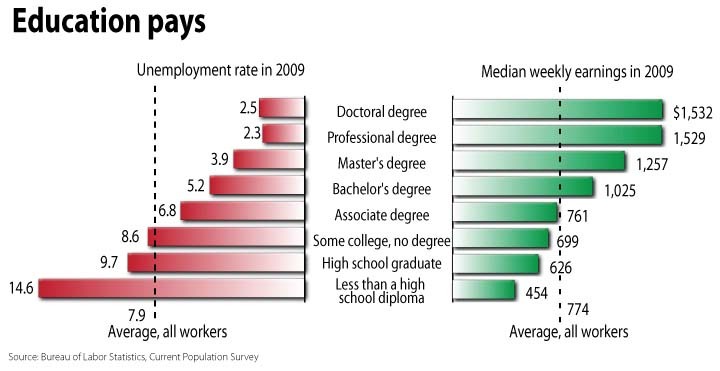 A college degree or retraining certificate certainly doesn’t guarentee a job. It certainly increases your chances. Then again it you’re majoring in Philosophy like some else we know you’re running a risk of being a waiter or working in a book store. Some people work at miserable jobs and live day to day in the same miserable fashion. Others choose to live a life where what they do satisfies their needs. There’s no shame it that – in fact, I find it quite noble. BS… I don’t really feel I was defending anybody with this post. Just sharing several articles I read recently and my thoughts after considering them. i don’t know what the parasites make up in terms of general population, but in terms of GDP the financial sector is now over 20%. that is significant, and makes their criminal extortion of the american people much more important than your obvious disdain for uneducated, unskilled americans and their need of government assistance. your claim, remember swede, is that uneducated, unskilled workers are hurting themselves. so, do you want this country to focus more on the need to educate folks? because we would agree on that. that means funding public education for poor people. do you support giving teachers the tools they need to educate low income students? do you support food assistance programs so kids can get some food in their bellies before the school bell rings? or are you just another boot-strap kind of thinker that wants to gloss over the growing economic disparity in this country, and how that inequality affects the quality of education poor people have access to. The average college graduates $20,000 in debt. If you come from a poor family you get more financial assistance. We don’t need to hand out any more money. And the financial sector-see my response to CFS. What ’bout my questions Liz? Do you use a bank/broker? I know someone that came from a “poor” family. Came from a farm in eastern Montana where the parents make little enough to qualify this person for every assistance program. After spending four years of undergrad and 3 getting an MS to work in the healthcare field this person is saddled with more than $80,000 in debt – and thats at a state school. This person got a few thousand a year in outright grants for tuition, the other major assistance came in the form of the feds paying for the interest on the loans. No more school, no more assistance on the interest. To me what they got in assistance vs what they put in + debt isnt fair. We give far more in assistance to the likes of oil companies in tax breaks and loopholes. Hell the federal government funds the whole secuity iindustry… but a few grand here and there to help people get edimacated is too much. Liz, I read you babbling and start to think, where have I heard this stuff before”? Then it comes to me, they arrested the wrong guy. Via Wiki. Industrial Society and Its Future begins with Kaczynski’s assertion that “the Industrial Revolution and its consequences have been a disaster for the human race.” The first sections of the text are devoted to psychological analysis of various groups—primarily leftists and scientists—and of the psychological consequences for individual life within the “industrial-technological system”, which has robbed contemporary humans of their autonomy, diminished their rapport with nature, and forced them “to behave in ways that are increasingly remote from the natural pattern of human behavior.” The later sections speculate about the future evolution of this system, argue that it will inevitably lead to the end of human freedom, call for a “revolution against technology”, and attempt to indicate how that might be accomplished. Except I’d have had more respect for Ted (sans murders and bombings) than you because Teddy truly lived what he believed. I’ll bet you say that about all the jihadists, too. Nice to see you’ve been boning up on the Manifesto, BS. Mandatory reading for all you Ruby Ridge/Freeman types. Left something out in the quote, JC? wow, swede. you got me pegged. nothing gets by you and your powers of perception. to answer your question, yes, i use a bank. unfortunately that bank is wells fargo. i even bank online, with my fancy mac computer. i don’t hate technology. i am not a luddite. i am also not living in lincoln montana in a shack, like that unibomber you apparently respect. you walked into this one, swede. you pointed out a correlation between education and unemployment. very astute. so what are the answers? you seem to think there is unemployment in the uneducated (usually poor) socioeconomic class because the machines are taking over. you seem to disagree with CFS that we have been losing manufacturing jobs along with the middle class. while machines may play a small role in job loss, it by no means explains the decades of wage stagnation. i realize you despise poor people and the government assistance they get. you are not alone. but if people like you were serious about strengthening this country’s work force, you would see the benefit of investing in public education. but you don’t support that, do you. we get what we pay for in this country. the cost of maintaining empire is domestic impoverishment. the cost of propping up insolvent banks is a decade of economic deflation for main street. the cost of wage stagnation is a dangerous reliance on creditors and their too often predatory lending practices. and the cost of spending more on defense than the REST OF THE WORLD COMBINED is there is no money left to invest in what makes us stronger, like education. Two points. First, dumping more money into public education has no correlation into the quality (test scores) of that education. Example Washington DC where the cost of public education per child is approaching $25K*. Even with all that money fewer than 50% of the DC public schools high schoolers graduate. Second, derivatives fraud and the financial meltdown would be a non-issue if it hadn’t been changes made in lending laws and the Fed strong arming banks to lend to the jobless. *$25K just happens to be the tuition at Sidwell Friends private school (Chelsea Clinton’s school). On a related note Castro just said “the Cuban model” just doesn’t work anymore.